Editor’s Note: James Daly, a lawyer and co-author of The Law and Superheroes, typically focuses his legal critiques on the superhero world at the Law and the Multiverse website he runs with fellow lawyer and co-author Ryan Davidson. 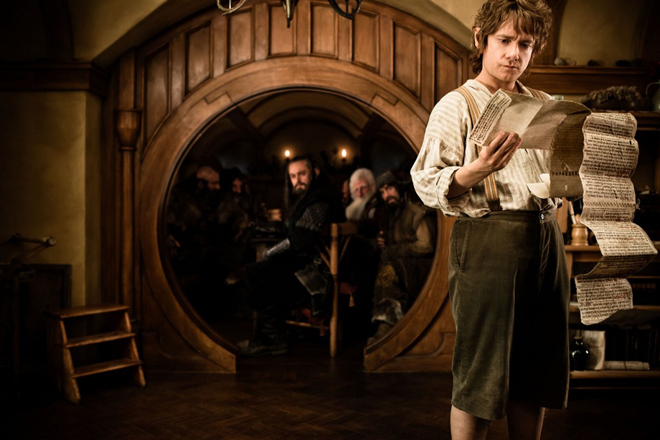 Today, Daly takes a look a very important cultural document for Wired: The contract between Bilbo Baggins and the dwarves in The Hobbit. First, it seems fairly clear (to me, anyway) that Tolkien wrote the Shire (where hobbits live) as a close analog to pastoral England, with its similar legal and political structures. For example, the Shire has a mayor and sheriffs, and there is a system of inheritance similar to the common law. The common law fundamentals of contract law have not changed significantly since the time that the Shire is meant to evoke, so it makes sense that the contract would be broadly similar to a modern contract (and likewise that we could apply modern contract law to it). For your hospitality our sincerest thanks, and for your offer of professional assistance our grateful acceptance. Terms: cash on delivery, up to and not exceeding one fourteenth of total profits (if any); all travelling expenses guaranteed in any event; funeral expenses to be defrayed by us or our representatives, if occasion arises and the matter is not otherwise arranged for. Even in the book’s version we see an issue: the dwarves accept Bilbo’s “offer” but then proceed to give terms. This is not actually an acceptance but rather a counter-offer, since they’re adding terms. In the end it doesn’t matter because Bilbo effectively accepts the counter-offer by showing up and rendering his services as a burglar, but the basic point is that the words of a contract do not always have the legal effect that they claim to have. Sometimes you have to look past the form to the substance. But back to the movie version: It has at least 40 major sections and numerous footnotes and digressions in smaller type. We will begin at the beginning and go on till we reach the end, except where the form of the contract requires some jumping around. I, the undersigned, [referred to hereinafter as Burglar,] agree to travel to the Lonely Mountain, path to be determined by Thorin Oakenshield, who has a right to alter the course of the journey at his so choosing, without prior notification and/or liability for accident or injury incurred. The aforementioned journey and subsequent extraction from the Lonely Mountain of any and all goods, valuables and chattels [which activities are described collectively herein as the Adventure] shall proceed in a timely manner and with all due care and consideration as seen fit by said Thorin Oakenshield and companions, numbering thirteen more or less, to wit, the Company. All contracts require some consideration from all parties to the contract. Consideration, in the contract sense, means a bargained-for performance or promise. Restatement (Second) of Contracts § 71(1). Basically, this is something of value given or promised as part of the agreement. This can be anything that the parties agree is valuable; the classic example is a single peppercorn. Whitney v. Stearns, 16 Me. 394, 397 (1839). Here, Bilbo is promising to go with the Company to the Lonely Mountain and performing various services there, including extracting the treasure, plus a few more services we’ll get to later. In turn, as we shall see, the Company promises to pay Bilbo one fourteenth of the profits, plus a few other obligations. Thus we have “a promise for a promise,” otherwise known as a bilateral contract. [Thorin has] a right to alter the course of the journey at his so choosing, without prior notification and/or liability for accident or injury incurred.” But on the other hand we see this explicit obligation of care: “[the Adventure] shall proceed in a timely manner and with all due care and consideration. Ordinarily “due care and consideration” signifies taking on liability for negligence, so this conflicts with the earlier liability waiver. Perhaps the two can be reconciled by the phrase “as seen fit by said Thorin Oakenshield and companions.” Thorin and Co. could always claim that the amount of care and consideration they saw fit was extremely minimal, though that runs the risk of making the clause meaningless, which courts usually don’t like to do. ”As a general proposition, whenever possible, the law favors reconciliation of clauses within a contract which appear contradictory.” City of Columbia v. Paul N. Howard Co., 707 F.2d 338, 340 (8th Cir. 1983). Taken together with the numerous other waivers and disclaimers, I think a court would probably conclude that Thorin & Co. were not taking on any particular duty of care. ”A writing is interpreted as a whole.” Restatement (Second) of Contracts § 202(2). Waivers or disclaimers of liability are an important part of many contracts. These can include waivers of a product warranty (seen all the time in software license agreements) and waivers for liability due to negligence (often required before doing something dangerous like skydiving). But there are limits to liability waivers. While a party to a contract can ordinarily waive liability for negligence (although not in every jurisdiction), one cannot waive liability for gross negligence, recklessness, or intentional misconduct. So the numerous (and sweeping!) waivers and disclaimers may not be as effective as they appear at first glance. So far the Dwarves haven’t committed any unsalvageable drafting errors or done anything that might jeopardize the validity of the contract. We’ll see if that keeps up! Burglar holds harmless and without blame in perpetuity the Company and its successors for any notoriety, incarceration, or proceedings brought against, in regard to or as a result of the adventure or any activities related thereto. Also includes slander, libel, loss of face or of social standing in country of Burglar’s origin. Remedies shall similarly not be sought for any unlooked-for misfortune befalling Burglar’s home during his absence. The smaller text is written in the margin or otherwise in smaller writing. There’s a lot of that kind of writing in the margins that we’ll be referring to as we go through the contract. For the most part the size of the print doesn’t matter, but there are some contract terms, such as warranty disclaimers, that must be printed conspicuously, which usually means large print or all caps. UCC §§ 2-316(2), 1-201(b)(10). At common law we suspect the rules were even looser. This set of waivers is not particularly objectionable. As discussed in the prior post, the actual scope of the waiver may not be as broad as the language suggests. For example, if the Dwarves intentionally burned down Bag End, this waiver would not prevent Bilbo from suing them for the damage. It may bear mentioning that the slander waiver only protects the Company. Bilbo could still sue the actual slanderer, of course. Traditionally this has been easier to do in England than the United States. At common law, for example, truth was no defense to criminal libel (also known as seditious libel). Garrison v. Louisiana, 379 U.S. 64, 67-68 (1964). Cash on delivery, up to and not exceeding one fourteenth of the total profit [if any]. Not including any of the gross paid to other parties in lieu of royalties or help and provisions given or loaned. All traveling expenses guaranteed in any event. But refer to attached and appended conditions, clauses and riders regarding any Return Journey. ‘Traveling expenses’ shall be understood to mean basic fare as seen fit by the Company. ‘Luxury’ catering or accomodation over and above this standard shall be enjoyed only at Burglar’s considerable [but justifiable] expense. Funeral expenses to be defrayed by us or our representatives if occasion arises and the matter is not otherwise arranged for. Basic funeral to ‘commoner’ or peasant standard is allowed for only. Lavish ceremonies and jewelled (sic) or gilded coffins not provided. Plain pine box is the normal standard. Transport of any remains, in whole or in part, back to the country of Burglar’s origin is not included. Burglar acknowledges and agrees that each item of the Company’s valuables, goods, money or merchandise which he recovers from the Lonely Mountain [the 'Recovered Goods'] during the term of his engagement with the Company, shall remain the Property of the Company at all times, and in all respects, without limitation. Furthermore, the company shall retain any and all Recovered Goods until such a time as a full and final reckoning can be made, from which the Total Profits can then be established. Then, and only then, will the Burglar’s fourteenth share be calculated and decided. So Bilbo can’t just pick up some treasure that he likes and decide that it’s part of (or the entirety of) his share. Instead, as provided by yet another clause, he will be paid in gold or its equivalent, in correct weight or of good quality, respectively. And he can’t lay claim to any particular article of treasure. Indeed, the Dwarves could conceivably purchase gold from somewhere else and pay him with that. He’s not entitled to any part of the treasure itself as such. As anyone who has read the book knows, the definition of Bilbo’s “fourteenth share of total profits” goes directly to a major issue in the plot, namely Bilbo’s taking of the Arkenstone. In the book Bilbo feels comfortable taking it, since he figures it’s worth his fourteenth share, and the contract didn’t say which fourteenth he could take. This contract eliminates that possibility. We doubt that the plot will actually be modified to take this into account, but it may be an example of the writer of the contract being a bit too clever. Confidentiality is of utmost importance and must be strictly maintained at all times. During the course of his employment with the Company, Burglar will hear, see, learn, apprehend, comprehend, and, in short, gain knowledge of particular facts, ideas, plans, strategies, theories, geography, cartography, iconography, means, tactics and/or policies, whether actual, tangible, conceptual, historical or fanciful. Burglar undertakes and agrees to maintain this knowledge in utmost secrecy and confidentiality, and to neither divulge nor make known said knowledge by any means, including but not limited to speech, writing, demonstration, re-enactment, mime, or storage and retrieval within means or apparatus currently known or unknown or as yet unthought of. This confidentiality agreement is a little overbroad, since by its strict terms it requires Bilbo to keep confident anything he learns on the journey, not just things he learns in confidence. The fact that information is already publicly known is usually a defense to a breach of confidentiality, since the information wasn’t actually secret. Overbreadth probably isn’t fatal to the clause, however. What’s really unusual about this part of the contract is that it doesn’t appear to include a clause acknowledging that monetary damages alone would be inadequate compensation in the event of a breach of confidentiality. The purpose of such a clause is to make it easier to obtain an injunction ordering the breaching party to stop disclosing the confidential information. Ordinarily breach of contract results in a payment of monetary damages, and getting an injunction usually requires showing, among other things, that those damages are insufficient to remedy the harm done. Burglar acknowledges that monetary damages alone will be adequate compensation for a breach of this contract by the Company. It’s curious that the contract only contemplates injunctions defensively (i.e. protecting the Company from them) and not offensively (i.e. making it easier to enjoin Bilbo). Jurisdiction: The Shire vs. the Dwarven Kingdom? The one thing that leaps out at me about this contract is that it doesn’t contain a choice of law clause. Such a clause allows the parties to specify what jurisdiction’s law will govern the contract. This is particularly useful when multiple jurisdictions may potentially apply. The area of the law that deals with figuring out which court has jurisdiction and which law applies is known as conflict of laws. The parties are a Hobbit of the Shire and a group of Dwarves. The contract was signed in the Shire. The contract concerns services to be performed in the Dwarven Kingdom. The most likely source of the breach of the contract occurs in the Dwarven Kingdom. Since the applicable law is debatable, this is precisely the kind of case in which a choice of law clause makes sense, so its absence is notable. Ownership of the Ring: Specialized Equipment? Given the clauses describing ownership of the recovered goods, one might wonder whether the Company has a claim to the One Ring. After all, Bilbo has expressly agreed that he has only a right to 1/14th of the profits, to be paid in a form determined by the Company, and no right to the treasure itself. So could it be that the One Ring merely forms part of the treasure? The contract seems to indicate otherwise. Specialist equipment required in the execution of duties in his professional role as Burglar shall be purchased, procured, purlioned [sic] or obtained by Burglar, by whatsoever method Burglar sees fit. The One Ring is definitely “specialist equipment” and it turns out to be required in the execution of Bilbo’s duties in his professional role as Burglar. Certainly he could not have defeated the spiders, evaded the Wood Elves, or snuck past Smaug without it (possibly only the last counts as proper burgling, but the point stands). So the Dwarves would not appear to have any claim to the One Ring. I probably would have left out the “purloined” part, though. That comes dangerously close to making the contract unenforceable on the grounds that the subject matter of the contract is illegal. One the whole, the contract is pretty well written. There are some anachronisms, unnecessary clauses, typos, and a small number of clear drafting errors, but given the contract’s length and its role in the film (which is to say not a huge one, especially in the particulars) it’s an impressive piece of work. I congratulate prop-maker and artist Daniel Reeve on a strong piece of work. A lesser studio or artist might have been tempted to go with several pages of lorum ipsum written in Cirth. If you’d like an even more accurate replica of the contract, Weta’s online store has a version with hand-made touches by Mr. Reeve.